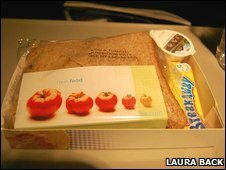 British Airways is to scrap all meals, except breakfast, on its short-haul flights in a bid to save £22m a year. The measure, starting next week, comes as the airline is trying to trim costs. It is raising more than £600m to help weather the recession, while thousands of staff have agreed to take pay cuts or work part-time. Currently passengers on short-haul flights typically get a sandwich. This will be replaced by a bag of nuts or another snack. But the carrier insisted it was still a "full service" airline, with those flying before 10am continuing to be served breakfast. 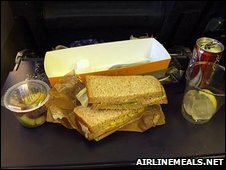 "When you fly with British Airways, the in-flight catering is top-class and, unlike some other airlines, it is free," a BA spokesman said. "It is not unusual to make small changes to avoid waste and save money where it makes sense and it meets customers' changing tastes." Its research suggested that it was only after two-and-a-half hours in the air that passengers require more substantial refreshments, the airline said. The British Airlines Stewards and Stewardesses Association (BASSA) - a union for BA cabin crew - said the airline had informed them of other cuts that it was considering. These include removing chocolates and Jacobs crackers from first class passengers, taking away hot towels in Club Class, and axing complimentary packets of pretzels in economy. Budget carriers have always sold food and drink as an optional extra. And Easyjet has revealed that the average passenger pays £10 per flight in so-called "ancillary revenues" - which includes items sold on board as well as checked-in baggage charges. BA will be looking at all of its business and "some sacred cows could go", said Laurie Price, director of aviation strategy at Mott MacDonald. 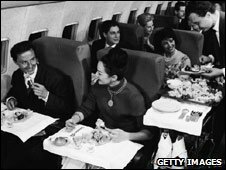 "Axing meals on short-haul flights will reduce BA's differentiation from the no-frills carriers," he warned. "But with things like not charging for checking in at a desk and free drinks, passengers are still getting more elements of a full service." He said that during the day, most passengers would have the opportunity to buy food at the airport, and so there would only be "marginal" profits if BA decided to sell food on board, after taking into account costs including transportation and cleaning. BA has been in negotiations for several weeks with unions over its wider plans to cut costs and has asked thousands of employees to take pay cuts or work for nothing. Earlier this month, BA pilots voted overwhelmingly to accept a 2.6% pay cut. Talks with unions representing cabin crew and ground staff are continuing, but if no resolution is reached, there are fears that the firm could face strikes by its 14,000 cabin crew.